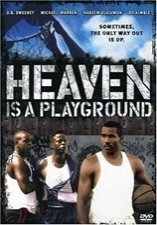 The mean streets of Chicago's South Side serve as the backdrop for this thrilling and inspiring tale of an inner-city coach and an idealistic lawyer who team up to oversee a basketball team comprised of troubled schoolyard hoop players. D.B. Sweeney, Michael Warren and Richard Jordan star; NBA stars Bo Kimble and Hakeem Olajuwon also make appearances. 107 min. Standard; Soundtrack: English Dolby Digital Surround.